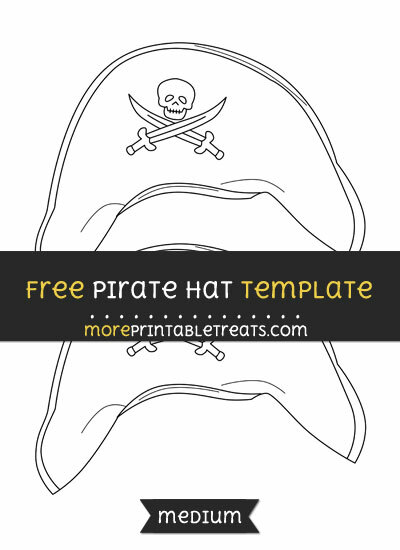 Print this pirate hat template (medium size) that you can trace or cut out. You can use this download to decorate a pirate theme craft or for whatever project you like! In this download there is one PDF page with two medium-size pirate hat outlines on it. This pirate hat template is a basic black and white line drawing with no color. You can print the outlines on a sheet of 8.5 x 11 inch computer paper and each will be as large as nearly half the page. I have also posted this template in multiple sizes (small, medium, large). To find them, search for “pirate hat” in the Templates category. These files are in PDF form and will download in a zipped folder. You will need Adobe Reader in order to open the PDF file. If you don’t have Adobe Reader, you can download it for free at Adobe.com.